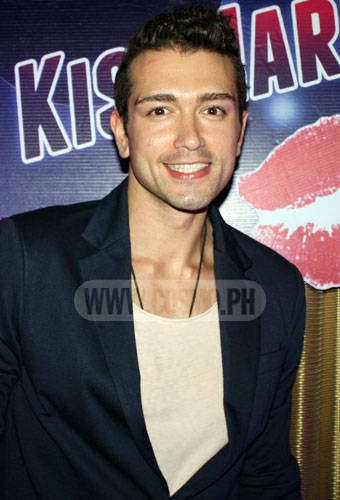 Our November Online Hunk recently participated in a dating game with bloggers. See what happened, and find out how you can go on a real date with him! Have you secretly dreamed of dating a Cosmo Online Hunk? Your wish just might come true soon, as our featured hunk for November, Mark Alejandro, is looking for a very special lady to date! To be that girl, all you have to do is kiss him (well, sort of!). Nivea Philippines and Cosmo.ph held a soiree of sorts last November 9 at Seventh High in Bonifacio High Street to introduce Mark and explain to bloggers the mechanics of the contest: To win a date with Mark, you have to play the Kiss Mark game on Facebook, where you click on different lip care products to plant virtual kisses on Mark! Incidentally, Nivea offers 12 lip care products that fall under three ranges for your different lip needs: Nivea Lip Care for daily moisture, Extra Care for repair and intensive moisture, and Color & Shine for playful, tinted pouts. (Watch for all variants in our beauty gallery, soon!) You earn points by choosing the right variant for different scenarios you see Mark in. By playing the game, you qualify for a raffle draw with awesome daily and weekly prizes, like Nivea gift packs and a Shiseido makeover worth P2,500! The grand winner will receive the full Nivea Lip Care range and go on a date with Mark! Lucky bloggers at the launch got a preview of the exciting contest when they were chosen to play an impromptu dating game with Mark, himself! Host L.A. Ferriols chose three guests to come up front and answer Mark's questions. In the end, he chose Martha Sta. Barbara of The Beauty Junkee, and they spent the rest of the evening chatting and dining in their little corner! How do you feel about being the first Cosmo Online Hunk to be introduced in a special event like this one? I feel honored since I'm the first one! This is totally new for me. Have your friends and family seen your features on Cosmo.ph? Yeah! My friends, so far, and my family have seen it. It's a bit awkward. (Laughs.) Weird, but in a good way, [because] I don't consider myself a hunk. Do you people recognize you from the photos when you're out in public now? Have you ever been on a blind date before? No, I haven't been on a blind date, [but] I'm game for anything. Everything has a first time, right? What are your tips for the winner of the Nivea Kiss Mark contest who will nab a date with you? Launch the gallery to see photos from the event, then go ahead and play the Kiss Mark game for your shot at a date with the hottie!